Hey y’all, it’s award time! Your most favorite author (and why). My favorite author is JK Rowling. Her tight plotting is masterfully done, and I love her amazing characterization and world-building ability. Your favorite genres. I read everything, but lately I’ve been reading lots of YA fiction (it’s like market research for my writing…). 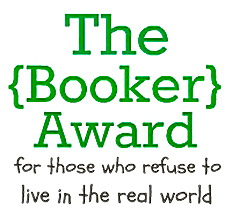 Give this award to 5 or more bloggers (see below) and let them know with a comment. Show this award off on your site and link back to whoever gave it to you. Small Group of Thoughtful People — My good friend Melanie writes a couple times a week about amazing things people are doing in the world. Dr. Doyle’s Editorial and Critique Services — Love Dr. Doyle’s thoughts on writing and editing! 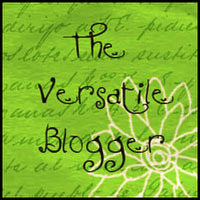 More Cowbell — Jenny Hansen’s hilarious author-techie awesomeness blog. My favorite color is burgundy, but I don’t like the color red. I have a twin brother. It still amazes me how often people will ask, “Are you identical?” Well, I’m a girl, and he’s a boy; what do you think? Goodness. When I was little, I had a Southern accent (I was born in the South, after all). There are home videos to prove this. Sometime after we moved to Florida when I was a kid, the accent ran away, but I can still pull it out of my back pocket whenever I want. I worked at an overnight Girl Scout camp every summer for 10 summers starting when I was a teenager, including a few summers as assistant director, plus a week here and there for a couple summers beyond that. Leaving teaching put a dent in my ability to work at camp. As hinted at in #4, I am a HUGE advocate of technology-free summer overnight camps. Not only are they cheaper than camps that have air conditioning, they teach your child independence. No matter what a kid grows up to be, she will need confidence and people skills, two things camp builds in abundance. I love Bananagrams. So fun. Linguistics fascinate me. I have hinted to my man that an OED might be a good gift someday. This is perhaps a holdover from my days as an English teacher/copy editor/Creative Writing major. Posted in Culture and tagged Audrey Niffenegger, awards, blogging, books, Jane Austen, JK Rowling, Madeleine L'Engle, Margaret Atwood. Bookmark the permalink. Writers frequently overlook the sense of smell to focus primarily on sight. Smell, however, packs a much tighter emotional punch; our sense of smell is associated very closely with the part of the brain that processes emotion. Aroma, fragrance, odor — whatever you’d like to call it — can frequently unlock memories and associations for both your characters and your readers, if used with finesse. A balcony ran around the room, for the spectators, and I thought I could smell, faintly like an afterimage, the pungent scent of sweat, shot through with the sweet taint of chewing gum and perfume from the watching girls. Atwood creates a feeling and uses this feeling to build curiosity. Where exactly is the narrator, and why is she here? We as readers want to know why we are here and where we are going, and in creating that curiosity, Atwood achieves an enviable goal. I slammed the door to my room, which really wasn’t my room. During school months, it was Gabe’s “study.” He didn’t study anything in there except old car magazines, but he loved shoving my stuff in the closet, leaving his muddy boots on my windowsill, and doing his best to make the place smell like his nasty cologne and cigars and stale beer. I dropped my suitcase on the bed. Home sweet home. Gabe’s smell was almost worse than the nightmares about Mrs. Dodds, or the sound of that old fruit lady’s shears snipping the yarn. Riordan gives us a feel for Gabe’s character and tells us something that will be very important to the plot later (though I won’t spoil it for you by revealing that bit). Gabe acts as a foil to Percy and his mother, Sally, showing us more about Percy and Sally purely through their reactions to him and interactions with him. However, in order to use scent efficiently, we can’t just toss on a few extra olfactory descriptors. The use of scent needs to pull its weight within the story. Does your use of scent in your writing pull its weight? Does it reveal character, plot, or important background information? Does it create curiosity or build an important feeling? If it doesn’t do these things, maybe it doesn’t belong there. Have you read anything where the sense of smell stands out or plays an important role? Which scents bring back memories for you? P.S. Check out a fun interview of Rick Riordan from Saturday’s Guardian here. Posted in Craft and tagged character, description, detail, dystopian, emotion, Margaret Atwood, Percy Jackson, revision, Rick Riordan, sense of smell, The Handmaid's Tale, The Lightning Thief, the senses. Bookmark the permalink. Having characters we can relate to — or at least understand — is part of what makes us want to keep reading. If we don’t care about the main characters and what happens to them, we probably won’t turn that next page. What does your character do that makes her unique? What makes him stand out above the sea of words and last in your readers’ memories? Quirks. 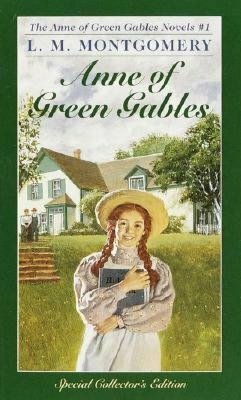 I clearly remember how Anne in Anne of Green Gables dyed her hair green because she hated her red hair, and it’s been maybe 15 or 20 years since I read that book. Anne Shirley, as a character, sticks in my memory because of her quirks. I still frequently call to mind how she compared herself to her adoptive mother, Marilla, saying that she didn’t want to just walk along in her life (like Marilla); she didn’t mind thudding into the ground every so often if it meant she was able to soar with the eagles for a while in between. That thought has stuck with me for years because author L.M. Montgomery gave Anne memorable, believable character quirks. Characters’ reactions to situations, however far-fetched those situations may be, must retain emotional integrity in order for readers to stick with the story. If the character’s parent dies, and the character just keeps on blithely going about his daily life, we must understand why. Otherwise, you will alienate readers. It’s one thing to have unsympathetic characters, but quite another to have unsympathetic characters without reasons why. For example, Scarlett O’Hara works as an unsympathetic character because we want to understand why she’s doing what she’s doing. However, unsympathetic characters with no reasons behind their actions (at least, no reasons apparent to the reader) will lose the reader. I was recently reading the third book in a triology where the main character had been fairly well established, and all of a sudden, he does something crazy that is never fully explained for the entire book. I finished the book since I was comparing notes on the book with someone else who was reading it, but I made the decision never to read any other book by that author again. I felt cheated. On the other hand, you can find a book with an incredible premise that wouldn’t generally happen in daily life, like Margaret Atwood‘s The Handmaid’s Tale, and it comes across as believable because the characters act in ways that make sense for their situation. When the main character (whose real name we never learn) in The Handmaid’s Tale savors every detail in her room because she can’t visit many places in the outside world, it feels very real for her situation. When she’s afraid of being discovered for her dissension, it feels very true to her character. What makes a character feel real to you? Posted in Craft and tagged Anne of Green Gables, character, character quirks, emotional integrity, L.M. Montgomery, Margaret Atwood, Scarlett O'Hara, The Handmaid's Tale, writing. Bookmark the permalink. What's So Great About Unreliable Narrators?